ESB Stopped at Clonmore. Teresa Treacy still defiant. 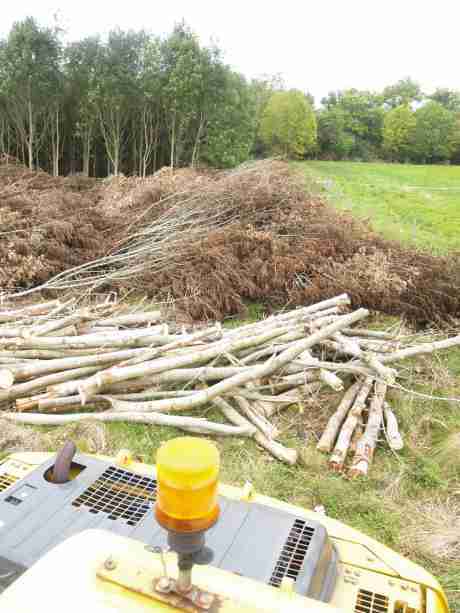 national | environment | news report Saturday September 17, 2011 15:11 by Teresa Treacy Support Group. "I'll never purge my contempt, and I want the ESB stopped. I most certainly do!" - message from Teresa Treacy, 65 years old, in Mountjoy Womens' Prison. On Wednesday the 14th of September, concerned individuals wishing to support Teresa Treacy arrived at Clonmore, Tullamore. 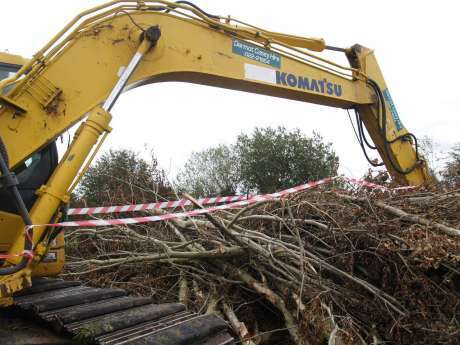 The following morning the supporters learned that no tree felling would be carried out that week and ESB workers had been instructed to leave the site. On the morning of Saturday the 17th of September, Teresa rang from the prison to say that her spirits had been lifted by the news. She has her own cell in the prison thanks to the good graces of the prison staff. After her initial shock she is settling in. She said she has no intention of 'purging her contempt' and is calling out for support. It is the ESB's intent to fell trees covering a total 12 acres of land and amounting to 12,000 trees in all, many of which are native species and were hand planted and maintained by Teresa over the years. 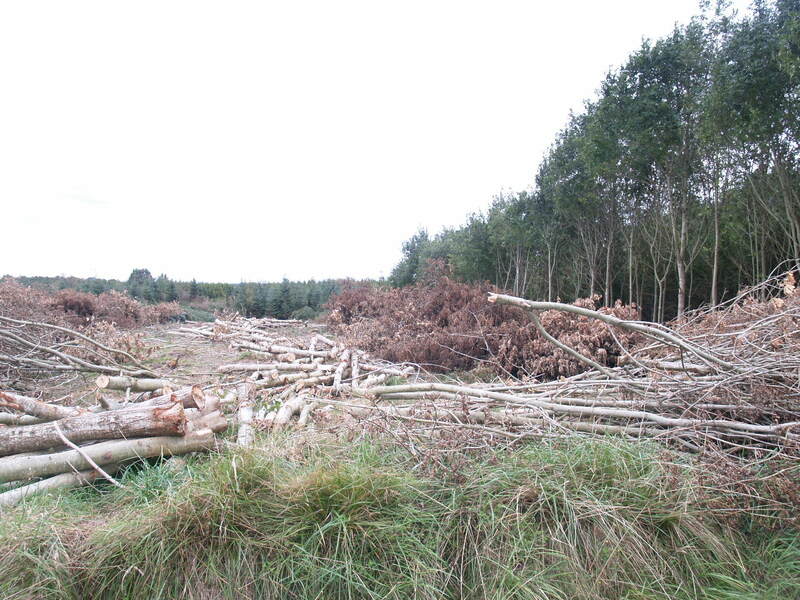 The end result being a 50m wide corridor permanently severing her woodlands in two for well over one kilometer. It is the intention of the ESB to fill the felling zone with one 20 metre high metal tower, five double wooden poles, a 110Kv single transmission line, and five continuous wires. 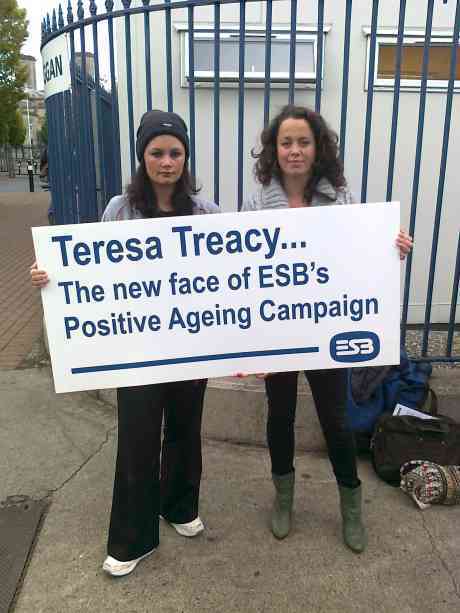 Teresa has been attempting to negotiate with the ESB since 2006. She has reluctantly offered a compromise of siting the line underground to no avail. Having spent her entire life as a law-abiding citizen, she has taken the path of peaceful direct resistance as a course of last resort. In a call from the prison, Teresa has asked for supporters to become actively involved in her struggle to protect her land and trees. Teresa is committed and remains defiant. She has no intention of 'purging her contempt'. To become involved, call Niall on 086 8444966.
together to cause the risks. not to be asleep on the job! and concentrate them in the areas around overhead lines. actually stick to the body due to this effect. Crime Scene. No Entry. ESB take note. Fair play to Teresa Treacey - Ireland is sadly lacking in trees. Only hope for people in Teresa Treacy's type of predicament? There is probably only one peaceful way by which people everywhere can achieve and maintain real emancipation from the injustices being wreaked by today's politicians, judiciaries, and the general encroachments of bullying governments worldwide: it is by the restoration of Courts of Trial by Jury. Only then are we likely to see the elimination of unjust, antidemocratic legislation which is at present being powerfully supported by the main weapon of despotic governments everywhere: the trial-by-judge. I am just wondering if Teresa has checked all the documentation (wayleave notice) she received regarding this110kv line. Does it clearly state there will be a 50 metre wide corridor through her private lands requiring 12 acres of her property and 12,000 trees to be felled. Ive read through the 1927 Act section 53 which deals with wayleaves across lands but I didnt see any mention of a 50m clearance. Im not a lawyer but this thought has struck me. It may be well worth getting good legal advice on all of this. saw another comment about this,it would appear that eirgrid dont actually have any "powers" under the 1927 electricity act to go on to private property.So therefore Eirgrid are treaspassing,ask them to get out right away and release this woman immediatly,put the dam wire underground and be done with it.Stick to your guns treasa!! Can we make it VERY CLEAR that all concerned people who read of Teresa's plight on this website or elsewhere need to TAKE ACTION. Whether that action is writing to Teresa or writing to their local govt. rep. or whatever, people must take action. If any astute people can provide a list of the most effective types of action here, that would be very useful. If you read this article and say "Oh thats terrible" and take no action you are inviting such treatment by these dictators on Irish People in the future. The time really has come for People to stand up and grow up, not to be dictated to but to dictate. These so-called government bodies are servants of the people. These so-called judges are sworn to uphold the Law of the Land and are servants of the People. They have forgotten this. We need to remind them and courteously help them down from their pedestal . Get angry and TAKE ACTION. They cannot trample over people as they are attempting to do with Teresa. It is wrong, immoral and unjust and every Irish Man and Woman has a moral and compassionate obligation to fight for this 65 year old Irish Woman currently penned into some hole of cell in dublin city. How bad does it actually have to get? Does it have to be your son or daughter, a relative or a friend? I say She is your relative, she is your Sister. In cases like this, huffing and puffing of the "Oh that's terrible" kind, seems to be of very little use on its own. It appears to to me that this entirely peaceful 65 year old woman has now provided us all with a very useful platform to confront public officials and bodies who seem to enjoy abusing their powers with impunity: IF, that is, large numbers of us take advantage (in a timely manner) of the opportunity she has provided. They've been getting away with their abuses and violations of the law for long enough now, and the time has come (I believe) when the tide should be turned back in favour of the millions of the Republic of Ireland citizens who are not members of the "ruling elite" cliques. It is a full week since Teresa was jailed, like the Rossport 5, with no jury and no release date ! Known elsewhere as internment perhaps. The Irish Times have four letters re her case for the letters page, the letters are under "consideration" for publication. People should write in, they done I believe, a half ok ed last week, much as I am not an IT fan, the letters page is widely read and is persuasive. Maybe pickets on ESB HQ ? BTW I am told they share a building with that venerable institution ANGLO IRISH BANK ! agree with last comment,protest outside prison and also more importantly outside esb and eirgrid head offices.where may i ask are the groups representing similar projects all round the country? their silence is deafning, groups like the ones in meath where thousands turned out to support them when asked to do so? Where are they now? doing deals behind closed doors ? Where are the farm organisations on all this? Is it ok to put this person in jail as long as its not an IFA member? Thank you Ms Treacy for what you are doing,you have guts,ill give you that. 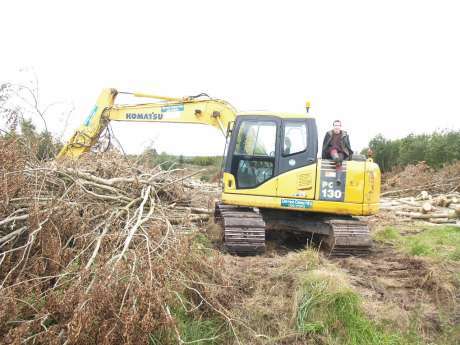 Are the ESB or EirGrid workers back at work on Ms Treacy's land or has the work ground completely to a halt? Jailing a lady like this is an utter outrage and disgrace. SHAME on all those involved. Where is the justice system that tells us we are entitled to own our property and to live peacefully upon it? Are we not called upon as citizens of Ireland and Europe to protect our environment our culture and our heritage? Arent we encouraged to plant more tress to make our country greener and keep our air clean? Why does all that go out the window to suit these HV powerlines that should be buried down in ducts along the side of the main roads? This year's Positive Ageing Week towns are: Arklow; Athy; Ballymun; Boyle; Cashel; Drogheda; Dublin; Dundalk; Dungarvan; Galway; Kinsale; Midleton; Sligo; Trim; and Tullamore. What to do? Ms Tracey, the ESB and Trees. participation in decision making, and access to justice in environmental matters in accordance with the provisions of this Convention.’ Teresa Tracey is an heroic person, the ESB is a blind bullying force and the Judiciary are an uninformed elite shrinking the spirit of their own people through the making of BAD Judgement. It's a disgrace putting teresa in jail, the comment is right people need to make an issue of this. We are all going through this in different parts of Ireland, Donegal, Meath, Monaghan, Cork, Galway in fact the majority of counties. EVERYONE involved in these groups needs to make their feelings clear to their public representatives. If everyone email or writes or phones the public representatives they cannot ignore everyone. Urge your friends and neighbours to do this. Or make up a standard email and send it out to all your members, friends etc to forward on to the politicians. PLEASE WAKEN UP AND HELP TERESA. It's a disgrace that Teresa Treacy is still in prison - is there a pickett? When is the next one? We will support you. The energy companies cannot be allowed to destroy the country like the construction developers did. I am writing to you to demand that you take action to secure the immediate release of Teresa Treacy. She must be released without having to purge her 'contempt of court' for trying to protect her human rights. All across Ireland our constitutional rights and our environmental laws are being broken by the ESB/Eirgrid. People will suffer from cancers and ill-health in the future due to having high voltage power lines overground in proximity to their homes. We need an open debate on our national energy policy. If not, our countryside will be destroyed by energy developers as reckless as the developers who bankrupt the country. The Government must compel these energy companies to put high voltage power lines and other utilities underground and alongside existing main roads. Teresa Treacy must be released immediately! I think the all the suggestions listed on this website, such as sending letters of support to Teresa and contacting the Oireachtas is good. I also found this online petition. Please sign it, forward on the link to your friends. it is very wrong that this woman is locked away in prison for standing up for herself ,what she is doing is for all of us and while i agree fully with a protest outside the prison,i really think there should be a major protest outside esb and also eirgrids office. Can someone explain this to me please? They put Teresa in jail for not allowing the ESB/Eirgrid onto her land, with the stipulation that she won't be released until she purges her contempt. Yet Eirgrid moved in immediately she was jailed. Was the intention to jail Teresa until she had purged her contempt or just until Eirgrid had finished their work on her land? If it's the latter, was Teresa not falsely jailed? Thoughts? Teresa Treacy's heroic stand is inspiring and proof that we are no longer going to passively accept the dictates of energy companies. Many people have died of cancer due to proximity to high power lines. This is an opportunity to widen the debate to include the oppressive tyranny of mobile phone companies whose masts have decimated communities throughout Ireland. Electrical fields and magnetic fields interact. Non-ionising microwave radiation ( emitted by mobile phones) is on the electromagnetic radiation continuum. Strong electrical fields and microwave radiation also interact. An electric generator is needed to power and strengthen the signal of the base station mast.. Electromagnetic radiation - produced by power lines, and microwave radiation - emitted by mobile phones and masts both cause cancer, blood disorders and depression/ suicide. The immune system is destroyed and whatever genetic weakness exists comes to the fore. A nationwide debate is long overdue in this country about the serious and proven adverse health effects of electromagnetic and microwave radiation. Pylons and mobile phone masts saturate this land. We have an epidemic of cancer and suicide particularly among our young people. There are thousands of people who have developed chronic radiation sickness and electrosensitivity as a result of forced involuntary exposure to microwave radiation ( mobile phone antenna masts ) and strong electromagnetic fields ( high voltage power lines). In at least four instances in Ireland that I know of, and the actual figure is far higher, young children developed leukaemia and brain tumours from having masts put beside their homes. All lived in poor areas. What kind of sick society have we become when our government is allowing our children to die in this way all because of a dependence on revenue from the mobile phone companies? What kind of sick society have we got when a pensioner is imprisoned for refusing to be exposed to a known carcinogen? Undergrounding the cables might have cost marginally more but instead a semi-state company chose to imprison an elderly citizen just for standing up for her rights. If we live in a democracy it is time that the government came clean and acknowledged the damage that overhead powers lines, mobile phone masts and mobile phones are doing to the health of the men women and children of Ireland.